The 2008 U-20 Cycling Supercamp is coming to a close. Riders from Ontario, the Yukon, Northern BC, Vancouver Island and the lower mainland congregated in the White Rock area for ten days of training and racing. There were longer road rides, four road races, three track sessions including video analysis, and recovery rides. Riders had a chance to meet and ride with quite a few of the local professionals. 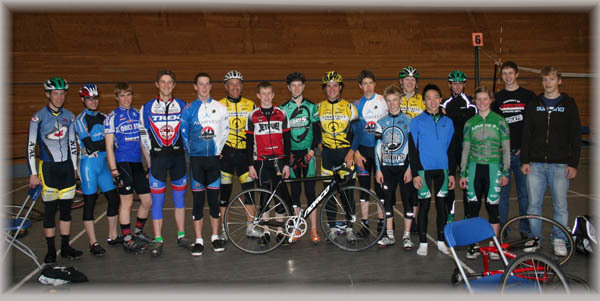 Pictured is the group at one of the Burnaby Velodrome sessions meeting Symmetrics riders Svein Tuft and Zach Bell. Below are a selection of comments from some of the camp participants. I enjoyed meeting other junior riders and going on great rides with them. I was able to push myself on the rides and got a great introduction to the track for my first time. I will definitely come back for more track time. Overall the camp has been a great experience with superb coaching. Learning from experienced coaches like Jeremy Storie and BC coach Richard Wooles has opened my eyes to the sport of cycling. Having the opportunity to ride the Burnaby velodrome has been a great experience. The video analysis was very beneficial for improving my racing. Ryan Aitcheson 16, Kitchener, Ont. Meeting junior riders from all across Canada has been fun. I enjoyed the variety of different meals prepared by different riders at the camp. I live in the general area and different rides we did were totally new to me. I liked how the rides were well organized and structured to meet all levels. Getting to meet and ride with professional riders such as Svein Tuft, Will Routley, Zach Bell and Jenny Trew was a great experience. It was great to ride with other juniors. It is rare for me to get to ride with large groups and especially juniors. Using radios on the group rides to help with directions and coaching from the follow vehicle was great. I loved the track sessions. I enjoyed getting to ride outside and not on the trainer. The races were great as part of the camp and I have never had a chance to race with groups that big. The track was also very enjoyable. The weather was promised to be potentially very wet and was the exact opposite. Great every day for the whole camp. To be able to do four road races and some track racing in March was a blast. I met guys and girls from all over Canada that I will keep in touch with. I plan on continuing to ride the track at London when I get back home.